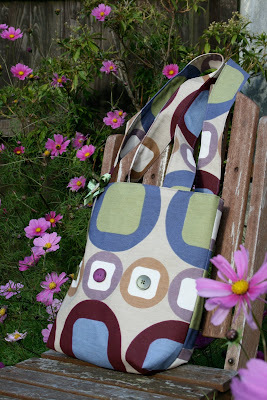 I do so love this squirly, circley design.. 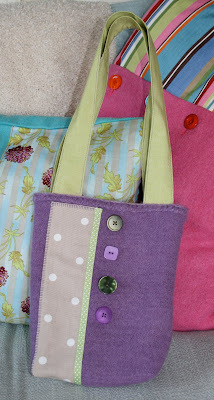 It's so much fun to do.. if you've never had a go at freehand embroidery on your sewing machine, I would urge you to give it a go... it's not nearly as scary as you think it will be and you will be amazed at what you can do!! This was definitely my most favourite make of the day.... a new cushion for the sofa! 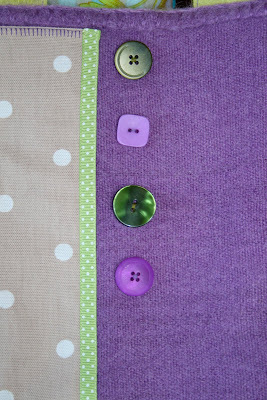 I just love the colours together and the big shiny buttons!! I do get moaned at for having so many cushions on my sofa, but I think you can never really have too many can you? As an aside..... see all those gorgeous cosmos flowers? Well, these are the ones that I grew from seed back in the spring, and they are STILL flowering profusely. I will be planting these again next year too as they are so easy to grow and give so much pleasure. I took a trip here last week ( I know it's loathed by many!!!) and came home with a few extra things that snuck their way into my shopping basket... such as some new sewing threads... oh, and underneath them is my new table cloth... I LOVE the colours, and, although it's waterproof... I vowed I'd never have another one of those now that the children are all grown up - I really wanted to have grown up, vintage, fabric cloths (I do have those too), this doesn't look at all plasticky, just bright and colourful... yay! This is the hardest part of the morning I think... choosing colours and styles!!! Well, wouldn't you find it hard with all of this amazing selection to choose from? 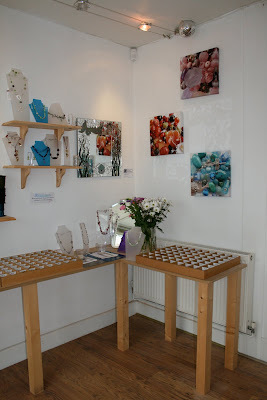 Here are just a couple of other shots of the shop... as you can see there are many, many trays of beads and findings and plenty of inspiration in the form of jewellery that has been made by Kate, at The Bead lagoon, and also some of my pieces too!!! 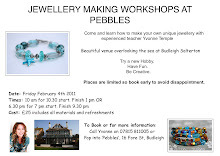 I would love to see you if you are in the area.... and if not, why not treat yourself to break and stay at Pebbles, which is not far away, and come along to one of the workshops... you will not be disappointed with either!!! I am now off to try and finish my promotional literature for some workshops that I will be holding at The Flavel in Dartmouth on the first three Tuesday evenings in December... could be difficult though as when I came to find the photo paper on which to print my posters, I discovered that there is only piece left... hmph! 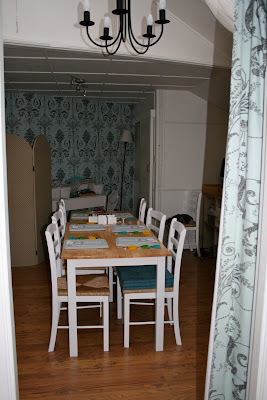 ... the others having been snaffled by a certain daughter who is taking photography as an 'A' level... grrrrr! Looks like I will be off to the shops then!!! p.s if you would like to know how to do freehand machine embroidery on your sewing machine, please let me know and if there's enough interest, I may put a tutorial on the blog.. woo hoo.. my first one! 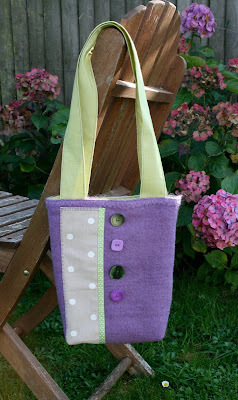 I Love those bags, the purple colour is so rich and wonderful. 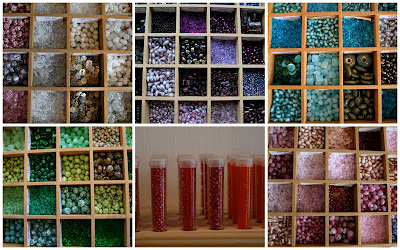 I don't recognise the bead shop in Sidmouth where is it near? but in one of the photos with a shop opposite looking towards the door there is a man walking he is my friends father! I would be very interested in machine embroidery. Thee is an award for you on blog if you wish to collect it. Wonderful!! I love the cushion, but then I would!! 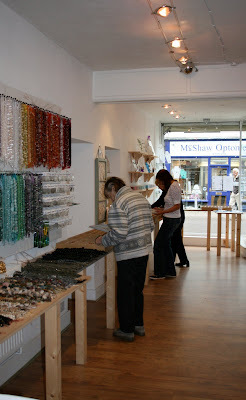 The bags are lovely - I really like those purply colours, and the bead shop looks a dream! I do like your bags! 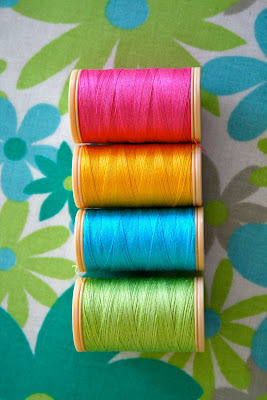 Especially drawn to the freestyle embroidery one, the colour is gorgeous! 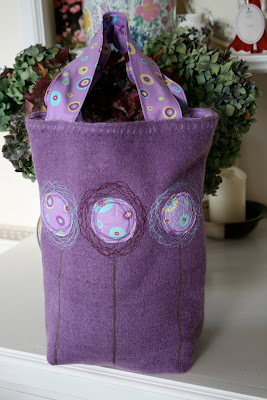 I have recently purchased Poppy Treffrys book on machine embroidery, so I would be eager to learn anything you might be sharing in a tutorial - I find this a really addictive medium to work with!